I discovered this pub by chance a couple of years ago and was pleased to note that it was a Fullers house, as I'm partial to ESB , and I must say the beer is well kept. Unfortunately that's where my admiration ends, because the clientele are some of the most foul-mouthed old tossers I have ever encountered. It seems that the pub is the repository of the kind of English grotesquerie that one imagines died out in the 18th century. It's possible to sit outside in the narrow lane off of the high road but the plonkers, who make your average Wetherspoons plonker look like the Marquess of Salisbury, are not content to remain inside and are likely to be encountered in the small seating area outside. Do not go there unless desperate for a pint of ESB..
A former favourite that recently seems to have undergone unnecessary meddling with furniture and lighting making it quite unpleasant to sit in. Shame. I did pop in to the Angel & Crown once, to check the football scores. An interesting little pub. Folks do well to find it, tucked away off the main high street down an alleyway to the church. Apart from the frontage, this pub has no windows. There are so many mixed reviews about this place i thought i would take the train from nearby Twickenham and check the place out for myself. Well i cant say anything bad about this place. I certainly found the toilets to be immaculate (maybe Chimay has a nose problem). The beer was fresh and very drinkable, the staff were second to none and the place was very busy. I found some great locals who were more than happy to tell me about the pub and its history. The staff have all changed in the last 3 months and the general census of opinion was that it had to happen.............for reasons i was told in confidence which i must respect. This is one of Fullers better pubs if not the best i have had the pleasure in going to and believe me i have been to many of them. 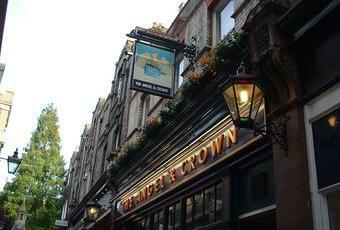 I think to summarize i would recommend the Angel & Crown to anyone into sport, good pub food and a great atmosphere.